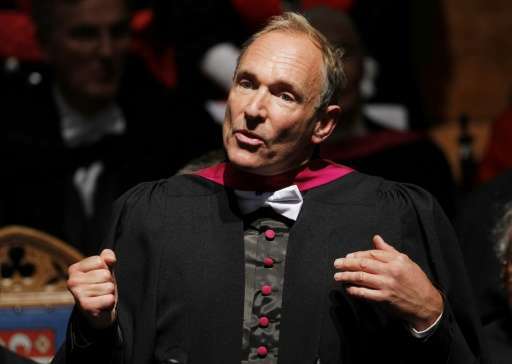 British web pioneer Tim Berners-Lee on Tuesday slammed as a "bad idea" recent calls in Britain and the United States to weaken cyber encryption. "I know that if you're trying to catch terrorists it's really tempting to demand to be able to break all that encryption," Berners-Lee told the BBC. "But if you break that encryption then guess what—so could other people, and guess what—they may end up getting better at it than you are," he warned. The computer scientist, who is credited with inventing the world wide web, was speaking after the British government called for a crackdown on encryption following last month's terror attack at the parliament in London. Berners-Lee on Tuesday was named as winner of the Turing Prize for computing, named after British wartime codebreaker Alan Turing, which comes with a $1 million (938,000 euro) grant from Google. He also slammed new legislation introduced in Britain last year—which was quickly dubbed the "Snoopers' Charter" by the media—which gives authorities the power to gather and retain data on citizens and to force technology companies to hand over user data. "The idea that all internet service providers should be required to spy on citizens and hold the data for six months is appalling," he said. "My ability to communicate with people on the web, to go to websites I want without being spied on is really, really crucial." Authorities eventually dropped the case after finding a way to break into the iPhone without Apple's help. He said he would fight "as hard as I can" moves by the US administration to do so.